The recent statutory consultation proposing the realignment of primary and secondary school catchment boundaries in the Currie and Balerno areas has been published (21/02/19). The report recommends that City of Edinburgh Council approves the proposals outlined in the statutory consultation paper. However, it also recommends that a guarantee be offered to the siblings of pupils living in the affected areas so that they may attend the same school as their elder sibling if they wish to do so. Time is quickly running out to respond to City of Edinburgh Council's current review of school catchment areas in the South West of the city, namely the realignment of the catchment for Currie Primary School, Nether Currie Primary School, Dean Park Primary School, Currie High School and Balerno High School. Balerno Community Council has recently responded to the consultation - the catchment area review is a high priority, and features prominently in the community council's draft community plan. You can read BCC's response in full here. BCC strongly recommends reading the material associated with the review and submitting a response to CEC. During the consultation period, any views on the catchment review's proposal should be sent in writing to CEC (Alistair Gaw, Executive Director of Communities and Families City of Edinburgh Council, Council Headquarters, Waverley Court. Level 1:2, 4 East Market Street, Edinburgh, EH8 8BG) or by e-mail to swcatchmentreview@edinburgh.gov.uk. All views whether by letter, e-mail or using the online questionnaire should arrive by 5pm on Monday 3 December 2018. Further information and the full statutory consultation paper and an online questionnaire are available at www.edinburgh.gov.uk/swcatchmentreview. Copies of the full statutory consultation paper are also available for inspection at Currie and Balerno libraries and at the schools affected by the proposals. 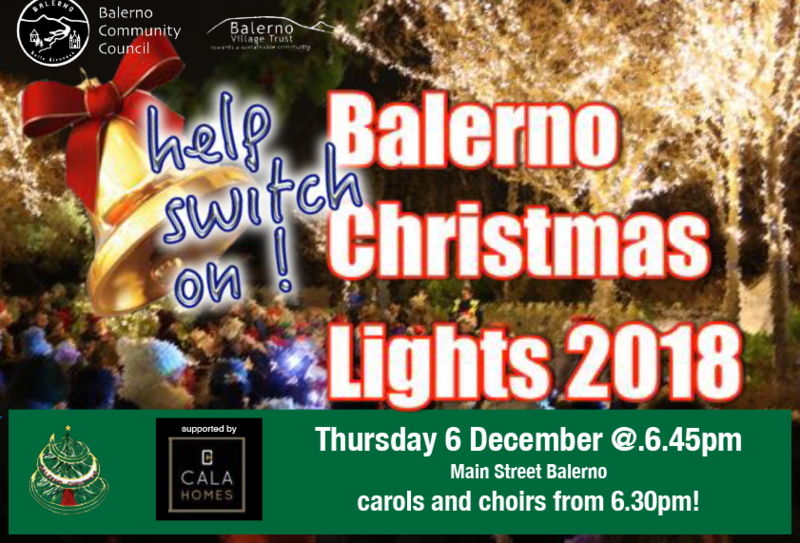 Following the continued success of last year's Balerno Christmas lights switch-on, the Christmas lights switch-on will be returning for 2018 - bigger and better! Lights will be switched on at 6.45pm on Thursday 6th December by pupils from Dean Park Primary School. DPPS Choir will be singing immediately after. The festivities will begin at 6.30pm, followed by the lights switch-on, where there will be carol singing and more. Astatutory consultation on a proposal to realign the catchment areas of Currie Primary School, Nether Currie Primary School, Dean Park Primary School, Currie High School and Balerno High School commences today, Tuesday 23 October 2018. At this stage no decisions have been taken. The public consultation will run until 5pm on Monday 3 December 2018. Following a significant period of informal consultation, the Council’s Education, Children and Families Committee agreed on 9 October 2018 that a statutory consultation should proceed on the proposal to realign school catchment areas in the South West of the city. The proposals are being put forward to address the increasing pressure on the accommodation at Currie Primary School. The proposals do not require that any existing pupil move to a different school. 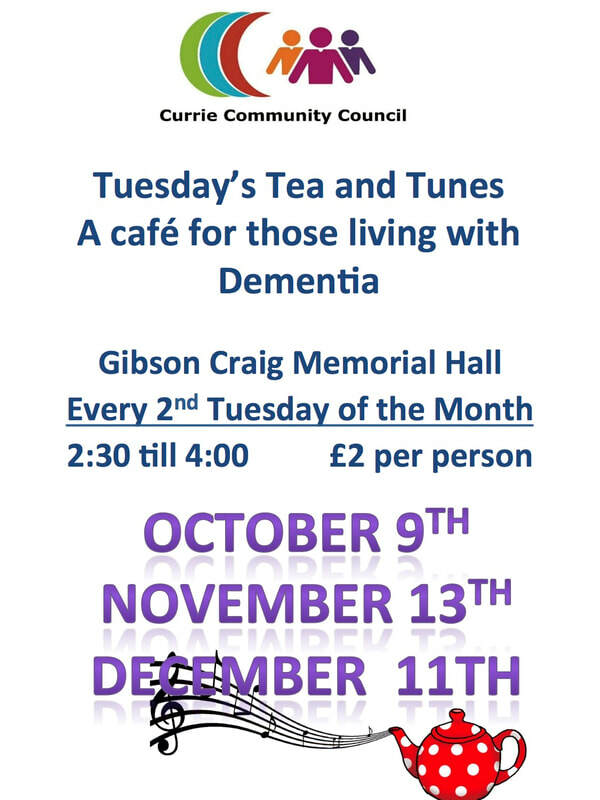 Every second Tuesday of the month, Currie Community Council are hosting a cafe for those living with dementia at the Gibson Craig Memorial Hall - a fantastic opportunity to get out and about, and have a great time.